The Expression number, often referred to as the Destiny Number, is an important core number. Derived from ALL the letters in your full birth name, it symbolizes the opportunities you have at your disposal, reveals your inner goal, the person you aim to be, and the talents, abilities, and shortcomings that were with you when you entered your human body. Expression(aka Destiny) Number is one of the core numbers that include your Life Path Number, Heart's Desire(aka Soul Urge), Day Number (the day you were born on), and Personality Number. To force the Y to be used as a consonant, use the asterisk * symbol in its place, and to force the Y to be used as a vowel use the pound # symbol in its place. However, for the Expression Number it does not make a difference in the overall result. 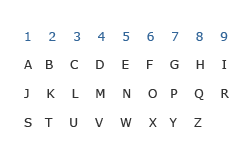 To calculate your Expression/Destiny number, assign each letter of your name a number from the chart. Do this separately for your First Name, Middle Name (if you have one), and Last Name (surname). For each of your names add the numbers up separately, reducing them down to a single digit value. When you have the numbers for each of your names, add these up and again reduce to a single digit to come up with your Expression/Destiny Number. The 1 Expression number indicates you are independent and individualistic. It represents the risk taker and a pioneering spirit. Self-reliant, confident, and perhaps sometimes overly opinionated, you are more likely to try the untested and new things. You like the freedom to choose your path and make your own decisions. Be wary of being overly competitive, and too self-centered and critical of others. The 2 Expression number indicates you are more intuitive and sensitive to the world and the people around you. You are more likely to crave balance and peaceful resolution to conflict, which makes you better equipped to work and deal with others. Be wary of being thrown off balance by negative people or situations around you. The 3 Expression number indicates you tend to be outgoing, with a more uplifting and optimistic energy than others. You are a creative spirit and likely more drawn to the Arts, or other similar outlets where your energy can be focused on bringing forth that which is in your imagination. Be wary of becoming too cynical, irresponsible, and undisciplined, as this will hinder progress in your creative ventures. The 4 Expression number is one of a builder. You are more grounded, methodical, and practical. Because you are likely more drawn to order and stability, you tend to be more reliable and responsible, and as such, are often seen as the bedrock of your family or business. Be wary of getting stuck on overly small details, and being too stubborn or rigid. The 5 Expression number indicates your love of freedom, excitement and new experiences. You are more of a free spirit, eager to explore and try new things. You tend to be very adaptable, hating the "routine" and not follow the social norms. Be wary of changing your mind too often, of getting bored too quickly, and leaving whatever the job or project at hand unfinished. The 7 Expression number indicates you are inquisitive, intelligent, and have a yearning to attain truth, knowledge, and wisdom in all aspects of what is the very essence of existence. You are likely to be more introverted and require your own space and alone time to pursue your own projects. Be wary of becoming too secretive, cynical, and cutting yourself off from those around you. The 8 Expression number indicates you are ambitious, disciplined, and hard working. These qualities, along with being a good and efficient planner, and a tendency to see things the way they truly are, often result in great success in whatever field you choose to work in. Be wary of being too stubborn and intolerant of others, and try to keep the right balance in all your pursuits. The 9 Expression number indicates you tend to be drawn to causes and endeavours with a purpose to make the world a better place. Idealistic, a humanitarian, and a visionary, you can inspire others to help you achieve the greater good. Be wary of craving validation for your work, and being taken advantage of by those who do not see the world as you do. The 11 Expression number is a higher vibration of the number 2, and as such indicates you are highly intuitive and sensitive to the world and the people around you ... sometimes even to the point of seeming psychic. You tend to be idealistic and crave balance and peaceful resolution to conflict. Be wary of being too idealistic, impractical, and sharing your feelings openly with others. The 22 Expression number is a higher vibration of the number 4, and as such is often referred to as a master builder. You are grounded, methodical, practical and with persistence, determination, and will power you can turn dreams into reality and create, build and accomplish things that will last for lifetimes. Be wary of being inhibited by doubt, and getting stuck on overly small details. The 33 Expression number is a higher vibration of the number 6 and is often referred to as the master teacher. You have a tendency to put the need of others before yourself, and often feel the need to sacrifice your time and yourself to take care of others. Be wary of being too overprotective, meddling into other peoples' affairs, and not giving those you care about their own personal space. I am looking for a hidden life path number. I want to know how each number has power over the other if they meet. I want someone to guide me or someone I will learn from. its not about the power over each other but working together. Each number has an power that benefits the other, these are gifts once you understand who you are and gifts are made to be given. Hi my DOB is 31/05/1977 and name I write is Priyanka Maheshwari. But I feel it is adverse to me since long. Plz help modifying my name, I can write Priyanka Kacholiya as well if suitable. my birth name is Kerry, however I've never felt like that name fit me. Around the age of 25 i began using my nickname 'Kez' and managed to become known to my friends and anyone new as Kez, which i feel fits. Using Kerry in the calculator on this page gave a completely inaccurate result so i tried Kez and the result was spot on! Can you shed any light on this?